Figure 1: T. S. Eliot. Thomas Stearns Eliot was born on September 26, 1888, in St. Louis, Missouri. His father, Henry, was a prosperous businessman, though something of a disappointment to his own father who had expected Henry to follow in his footsteps and become a prominent Unitarian minister. Eliot’s mother was a teacher and a poet. Eliot attended a school in St. Louis founded by his grandfather, and then in 1906 went to Harvard University, whose president at the time was Eliot’s cousin. He majored in literature, earning a B.A. and an M.A. By 1910, he was determined to become a poet, and by 1911, he had written one of his iconic poems, “The Love Song of J. Alfred Prufrock.” He was only 23, yet he managed to tap into the consciousness of a middle-aged man, whose low self-esteem ultimately inhibits him from singing the love song he had hoped might win the heart of a woman he hopes to seduce, if not marry. Over the next decade, Eliot’s poetic output diminished as he worked on his Ph.D. in philosophy. 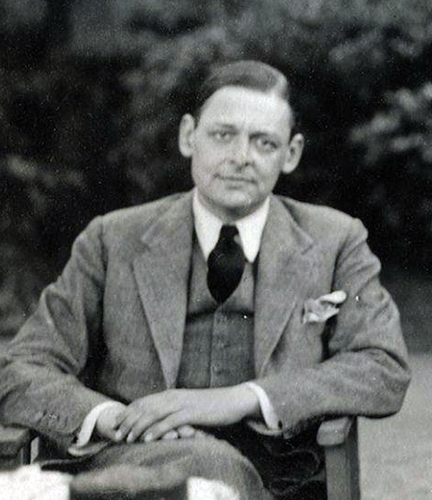 His first book, Prufrock and Other Observations, was published in 1917, and except for the poem the title alludes to, the book contained little upon which Eliot’s reputation is now based. By that time, Eliot was living and working in London, having moved to England to study at Oxford University as part of his Ph.D. requirements. He married, worked as a banker and a literary editor, but he was not happy. His marriage was floundering; he was overworked; and Europe was at war. He suffered a nervous collapse, and, on the advice of his physician, took three months off, part of it spent at a sanatorium in Switzerland. As it turned out, Eliot’s circumstances were auspicious for English poetry. Since 1914, Eliot had been planning to write a poem expressing his disillusionment with the war-torn society and the course his own life had taken. He began to write the poem in 1919, which he showed to his friend Ezra Pound, himself an influential poet and critic who had championed Eliot’s work and helped him find publishers. Pound edited the poem, deleting sections he felt were superfluous. Eliot concurred. The result was The Waste Land, one of the great poems of the 20th century. The Waste Land describes a quest for spiritual fulfillment, which is stymied by the social, cultural, and spiritual malaise, which gripped the Western world during and after World War I. The identity of narrator who undertakes the quest shifts dramatically as the poem progresses: at times is apparently Eliot himself; at times an array of mythological, historical, and fictitious characters. Time and place shift also from Mylae in the third century B.C. to present-day London. Structurally the poem is a montage of events and images, dazzling in their intensity, some related to each other, some deliberately disorienting, the effect meant to reflect the confused despair of post-war Europe. There are glimpses of hope, usually taking the form of a veiled offer of spiritual rearmament. There are also hints of ways out of the waste land, but the narrator never quite finds them. Eliot may have exorcized his demons after writing The Waste Land. Certainly, his life took a turn for the better. He became the editor of an influential literary journal The Criterion, which published The Waste Land, and, in 1925, he became the literary editor of a major publishing company, Faber and Faber. In 1927, he realized, at least in part, some of the stability he sought when he joined the Church of England and became a British citizen. His 1927 poem, “The Journey of the Magi,” reflects the hope for a better future that the Three Wise Men experienced upon visiting the infant Jesus. So too does The Four Quartets, a collection of four long poems, which Eliot began to write in the early 1930s and published in 1943. The Four Quartets are famously opaque, but, typically, their form and language reflect their theme. Eliot’s purpose was to capture the “timeless moment” of the body’s union with the spirit, to try to describe, in a word, the Incarnation. The moment is outside of time, outside of history, outside language, but the poet’s challenge is to render them in the language the experience defies. Eliot’s success in doing so produced a collection of poems that rival The Waste Land as the crowning achievement of his career. Eliot also wrote plays, which he hoped might bring his Christian and conservative values and attitudes to a wider audience than his poetry and criticism reached. The plays he wrote in the 1940s and 1950s—The Cocktail Party, The Confidential Clerk, and The Elder Statesman—feature upper-middle-class English families, working their way through a variety of crises provoked by infidelity, sibling rivalry, and past indiscretions, bordering in some cases on criminal behaviour. The families are redeemed and their harmony is at least partially restored through a renewed commitment to Christian values. Today, Eliot’s plays are not held in as high esteem as his poetry is, though they were well regarded in his own time: The Cocktail Party won the Tony Award for the outstanding play of 1950. Certainly Eliot’s drama helped secure his reputation as an outstanding international man of letters, and he was the winner, in 1948, of the Nobel Prize for literature. Thereafter, he semi-retired, writing mainly cultural and literary criticism. In 1957, he married his secretary Valerie Fletcher, nearly 40 years younger than he, and lived happily with her until his death from emphysema in January, 1965.